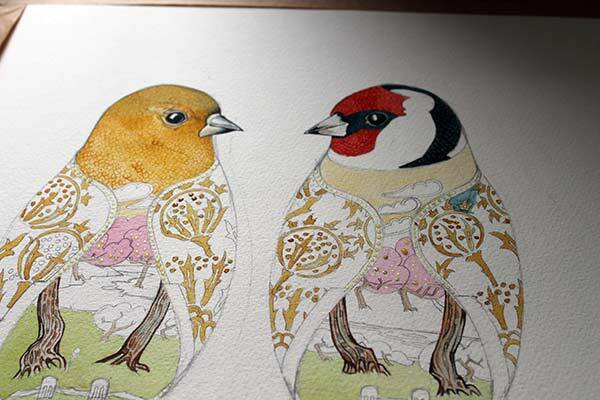 The goldfinch is rich in symbolism, it has been featured in hundreds of Renaissance paintings. In Paintings of the Madona and child the bird if often perched or nesting in Mary’s or the christ childs hands. So what is the weighty symbolism that places the goldfinch in the centre of, for example Raphaels painting, Madonna del cardellino? Its symbolic meaning stems form its elaborate plumage and its feeding habits. Goldfinchs have red checks and in the medieval mindset, these were acquired while the bird was trying to remove christs crown of thorns in an act of mercy. Goldfinches also eat thistle seeds and together these two things associate the bird with Christ’s Passion and his crown of thorns. Another layer of meaning has been attributed to the eating of thistle seeds, In europe they were used as a medicinal ingredient to combat the plague. So through this association the Goldfinch also became a good luck charm. Bestowing good heath and warding off disease from those who either saw a goldfinch or owned one (more on that later). So with the warding off of disease and vibrant health associated with it, the Goldfinch also came to be a symbol of endurance.. This symbolic combination when rendered in Renaissance painting of the Madonna and child came to be an extend metaphor of the salvation christ would bring through his sacrifice. Hallelujah! So all of the Christian symbolism is symbolism enough for any bird you might think! But, no! there is more! Freedom! Freedom Freedom! The Goldfinch is very dextrous. Because it feeds on thistle seeds it has become a deft touch with its feet and beak and can be trained to perform tricks. Known as a Draw bird, it has the ability to pull up a weight (a thimble if water) attached to a thread, by looping each length under it’s foot. The Gofdfinch has been a popular choice as a cage bird in Europe for ceuntries. Carel Fabritius 1654 painting, Shows a The Goldfinch tethered to it’s pearch by a delicate chain. You might say, if you were a cynic, that the Goldfinch has brought this upon on itself, showing off with its fine singing voice, beautiful plumage and deft touch with its feet and beak. 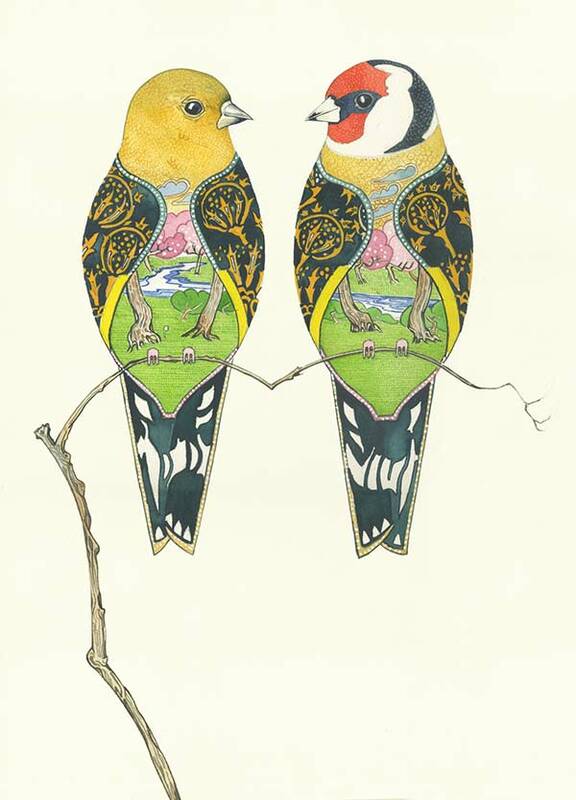 The Caged Goldfinch comes up as a reference to freedom in two poems by Thomas Hardy, “The Caged Goldfich” and, “The Blinded bird” both communicate the same outrage of having freedom taken. In fact a number of other poets have used the Goldfinch in their work. Russinan poet Osip Mandelstam knew a thing or to about freedom, he was was excelled by Joseph Stalin’s government during the repression of the 1930’s, his poem “The cage” illustrates freedom withheld. “Who gives this Maid away? So for a small bird, the Goldfinch has been loaded with a lot of symbolic bagagge. This entry was posted in animals, painting and tagged Freedom, Goldfinch, Renaissance, symbolism. Bookmark the permalink.